This Sunday I heart post comes to you direct from my Dad's study. I am home visiting my parents, and also my sister who has just flown back to Australia after living in Sweden for the past couple of years. (Welcome home Elspeth!). So for this week's Sunday Stamps, I decided to flick through my Dad's collection of First Day Covers from when he was a boy, to find something suitable for the theme of 'the post'. Any regular readers of this blog would know that I am particularly fond of 'post' and choose to define it broadly. 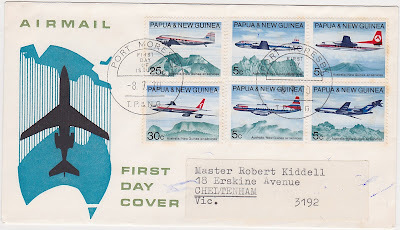 Although I did not find any stamps with post boxes or stamps on them - I did find two covers celebrating airmail. The one above is from Western Samoa (which has now dropped the 'Western' from its name and is officially the Independent State of Samoa). 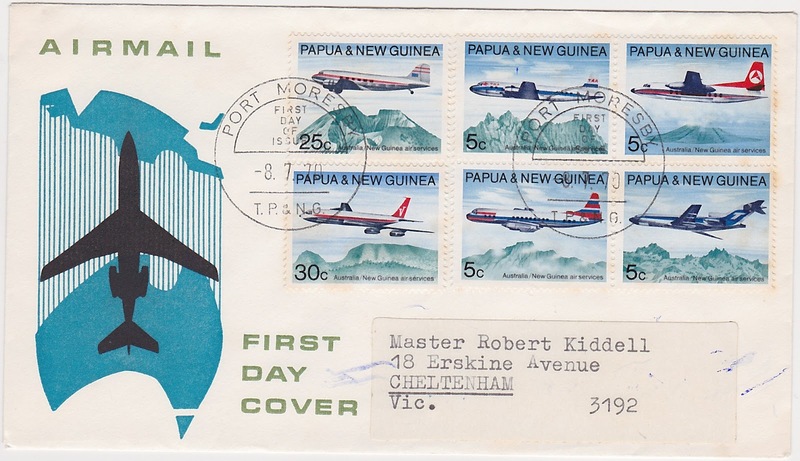 Also within Dad's collection I found another contemporaneous cover celebrating airmail from Papua and New Guinea, also issued in July 1970. The stamps are very nice, with the planes flying over volcanoes (after my recent trip to Indonesia I am most definitely into volcanoes: almost to the point of starting a second blog called "I heart volcanoes"). But the other thing I like about the PNG cover is the stylised image of Australia and Papua and New Guinea linked by the plane. Pretty cool. 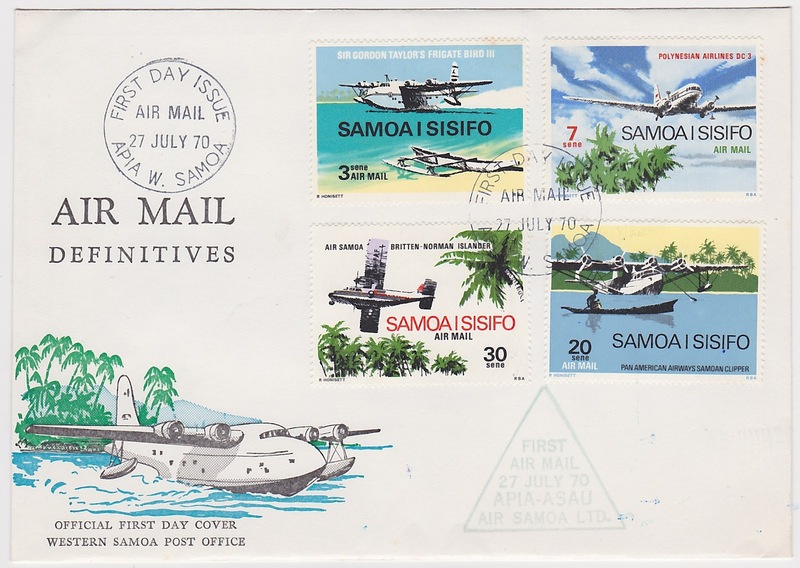 I am seriously starting to wonder why I loved just plain old stamps all these years, when I could have been loving first day covers, which are stamps with the added bonus of designs on envelopes and fancy postmarks. Who knows why I was so slow to catch on, but the important thing is now my passion for post has enlarged to definitely include FDCs. 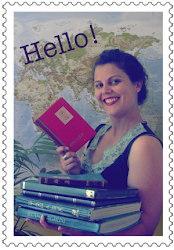 And when airmail and volcanoes are involved, it is just the icing on top! For other post related blogs this weekend, check out Viridian's Sunday Stamps through the button above. Happy Sunday! Happy Sunday to you too Helen. Is your mum a stamp collector too? such lovely stamps! plus coming from rare countries makes them so special! I can't decide which I like best flying over volcanoes or flying boats. Great set of covers. Those are very attractive first day covers, but I think most first day covers are kind of boring and not especially attractive. Lovely stamps and I know what you mean about the covers. I started getting into FDCs, but also more 'ordinary covers', which gain in interest over time, and special cancellations. I can see why you are into volcanoes; great stamps. I think I have the same sort of flying boat (clipper) on the USA stamp I've posted. Fine series of stamps. You have a very cool collection.can't decided my favorite. This has a cool envelope too. not all FDC's do. I just like accumulating stamps myself. Thank you for participating!